Since the Wraith: The Oblivion Kickstarter launches in a couple of hours, I figured today would be a good day to talk about one of my favorite bits of Promethean – the journey to the River of Death. In Promethean first edition, Created characters could return from death once. The character’s Azoth would flare (and the trait dropped to 1, which was kind of a bitter pill to swallow, but y’know, at least you weren’t dead), and the character would return to life. 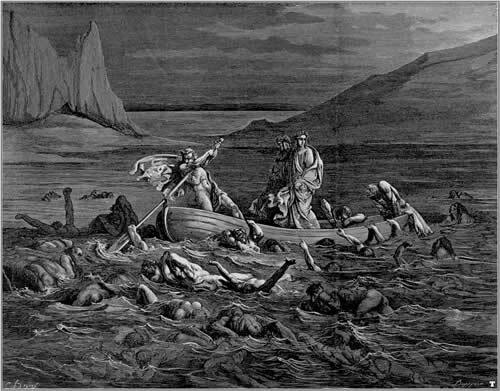 The notion of actually going to the River of Death didn’t come up until Pandora’s Book. Justin Achilli wrote the opening and chapter fiction for that book, and included the journey to the River. I thought it was really cool, and kept it in my games. And then, a few years later, we did Geist and fleshed out the Underworld and the Rivers of Death, and now that we’re doing Promethean 2nd Edition, well, it seems silly not to fold all that in. So: Below is an excerpt from the Storyteller chapter of Promethean 2nd Edition, written by Stew Wilson, about running scenes in which Promethean characters die and visit the River. If you want to see one in practice, I ran such a scene a while back in my own chronicle. You can read it here (but you may need to read more of the thread to get the context for what’s happening). To know life, a Promethean must also know death. Some of the Created get lucky. They never come across nests of Pandorans, never provoke an angry mob or a Wasteland or a Firestorm. Those that do get away with only enough scrapes that the Divine Fire can repair their tattered flesh. Their luck holds throughout their Pilgrimage as they come closer to the Magnum Opus. But they cannot live, not yet. In many ways, life is change — someone can change the world by bringing down a dictator or change herself by taking up a new hobby. One of those changes, the ultimate change, is death. Life is a temporary situation. It has an end. The Created have to be prepared for that end. Other Prometheans — possibly the majority, though their numbers are small enough that nobody can say for sure — don’t have a blessed Pilgrimage. For whatever reason, they suffer the slings and arrows of outrageous fortune, and the shotguns and firebombs of a people aggrieved. They know what it’s like to fight or to flee, what it’s like when bones snap and muscles tear, what it’s like when they take a chunk of rubble to the face and everything goes black and death claims them. It does so only briefly, however. When she first dies, a Promethean’s Azoth flares, bringing her back from beyond. Before then, she feels what it’s like for a human to die and awaken in the Underworld, a twisting network of caves and caverns where the Dead abide. Her Azoth brings her back, but only once she has sipped from one of the Rivers of Death. If several of the characters died in a violent encounter — a gang-fight, a house fire, an angry mob, or a Firestorm — she might suggest that all of the characters died in that encounter. While the rules may say that one or two survived, the players may find the lure of a superlative milestone too much to resist. If only one or two characters died, she may prefer to run the River of Death as a scene featuring those characters. The other players take the roles of ghosts relating to the characters — friends or victims who died because of the Created. If just one character died, the Storyteller may ask the player about running the River of Death as a solo scene, either after a regular session or over chat or e-mail in between sessions. Though she loses out on having the other characters taking part, one-on-one scenes are more intimate to the character in question, and lend a sense of mystery when the other players don’t know exactly what happened. If the character hasn’t died before attempting the Great Work, she does so as part of her transformation. This is functionally similar to the other kinds of journeys to the River, but the character may be better prepared for what he will find — or unaware of what awaits him before the New Dawn. A dead Created awakens at some point in the Underworld, a never-ending network of tunnels and caves. Some are barely big enough for her to squeeze through, while others are big enough that she might mistake them for the outside world. The geography is always stark and rocky. Her destination is somewhere in front of her, deeper in the caves — one of the mighty underground rivers that flows through the caverns. When she comes to the river, she must drink from it. The Storyteller can make the journey as short or as long as she wants. If the character has to make much of a journey, she will encounter ghosts relevant to her life so far. Some will be victims of her actions, either directly or indirectly. Others will be people who she has mirrored, or who went through the same things she did. Some will be friends, some will be enemies. All of them recognize her as something different. All of them have something to say. In some situations, the Storyteller will want to run the River of Death scene for one or two characters. In that case, she can hand off duties for playing the dead to other players. The easiest way is to jot down a name and a couple of personality traits on an index card, along with how the ghost is relevant to the characters, then let the other players run with it. The Storyteller retains a veto over their actions, but she’s free to describe the environment as the players move through it. Finally, the Created arrives at the River of Death. The Underworld has many rivers, and each Created comes to a different one. Drinking from the river takes some of the Underworld into herself, internalizing the death that comes with life. The Storyteller determines which river the character arrives at, though it normally relates to her life and actions so far. One who has caused sickness or Wastelands may come to the diseased River of Pus, while one who is quick to anger may come to the River of Blood or the River of Hate. 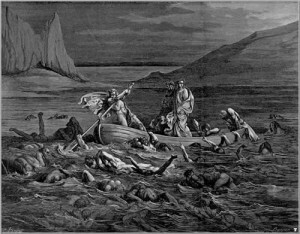 Characters who belong to a branded throng who journey to the River of Death at the same time arrive at the same River, based on their actions as part of the throng. Other Created who die at the same time journey to a River based on their individual actions. Normally, drinking from the river is enough to spur the character back to life in a flare of Azoth. If a player is willing to start a new character (or is leaving the game), the Storyteller may — with his permission — have his character die instead. The Created can’t expect to come back to life. This is still a once-only deal, right? “When she first dies”. Thank you, Chris, for inventing my new favorite word. Unless you’re an Osiran. They can visit the River multiple times, but they pay for the privilege. I really wish I could play Prometheus. It’s my favorite nWoD line by far. Just don’t have the player base. I like that this makes Promethean resurrection less of a sure thing for the majority of the Created (I’m presuming the Osirens keep there “I can’t die” ability). I’m also interested in the thematic link this more obviously draws between the Principle and the Underworld. Obviously its always been there, but this seems version seems to highlight the link a bit more. If Azoth and the Principle are a creative force in the world when we can view the Underworld as perhaps an entropic force maybe? A sort of counter-balance perhaps? Though Flux fits that role too…hmmm. I like the mystery of the interplay. Leaves a lot of metaphysical “meat” for an ST to sink their teeth into and come up with interesting stuff. Azoth is a creative force, Flux is a destructive force. What remains? Not a force, but the absence of force. I like this part. I can’t remeber if it was so in 1st edition, that you died as part of becoming human, but it is a very nice touch. I fully plan on running a game someday where the characters are a Promethean, a darkling, a Moros, a Sin-Eater, and a demon who all just randomly meet up in the Underworld. A Mekhet or Nosferatu, though. I have done that, It is amazing. After which the go to a bar. My Geist game featured a coffee/cupcake shop that had an Avernian Gate in the basement. I like the idea of these Rivers. I’m surprised one of the possibilities of the ghosts you meet aren’t the ghost(s) of the mortal(s) out of whose body/bodies you were made. It’s certainly something I’d include. Oh, good point. I’ll have to put that in.